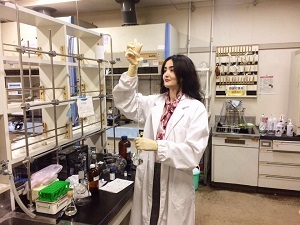 PhD student of BSU Nanoresearch laboratory, AlmaraRahimli, carries out research work at the Applied Chemistry and Biochemistry Department of Kumamoto University, Japan. The visit takes place through the invitation by Professor of Department Head of Applied Chemistry and Biochemistry Hirotaka Ihara and all visit expenses are covered by Japanese government. At the frame of internship AlmaraRahimli will investigate the technology of acquisition and stabilization of TiO2 nanoparticles by the use of new carbon modification method. She will also study the possible applications of these novel hybrid materials. It should be noted that at the Baku State University recently, special attention is paid to the dual management issues of PhD students. 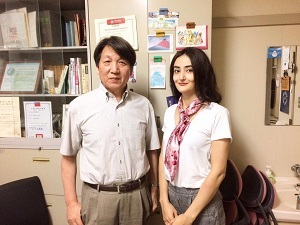 The supervisors of the PhD student AlmaraRahimli is Dean of the Faculty Physics of Baku State University, Professor MahammadaliRamazanov, and Professor of Department Head of Applied Chemistry and Biochemistry Hirotaka IHARA.